Thanks for using Fohlio. Our goal is to empower individuals and organizations to create amazing spaces. As such, we take very seriously the respect and protection of your privacy and security. We are committed to following and continuously evolving best practices to support this principle. Fohlio may collect and store any personal information you enter through the Services or the Site. This may include personally identifying information, such as your name, username, location, e-mail address, company name, company logo, pictures, images, and/or credit card information. Fohlio may also collect any information located on websites that you visit in your Chrome browser while using our Chrome plugin. We try our very best to safeguard your data. However, no system can be completely secure. Therefore, Fohlio does not promise, and you should not expect, that such information may not be inadvertently collected and that such personal information will remain secure. You also may give us permission to access your information on other services. If you connect to the Services using your LinkedIn or other third-party service credentials (each, a “Supported Platform”), you authorize us to collect your authentication information, such as your username, encrypted access credentials, and other information that may be available on or through your Supported Platform account, including but not limited to your name, pictures, and connection lists. The information we get from Supported Platforms may depend on your settings or their privacy policies. Fohlio does not store any user financial information, even though we may request information about you and your credit card and/or bank account. Fohlio does not store certain financial data due to its use of third party agents, such as Stripe, as its financial transaction facilitator. That financial information is handled, processed, and stored by the third party financial transaction processing companies. Please refer to such third parties’ Terms (https://stripe.com/us/terms) and Privacy Policies (https://stripe.com/us/privacy) for more information about how these parties use your information. To the extent that Fohlio uses third party providers such as Stripe for financial transaction services, we believe that such third parties take the privacy of your personal information seriously and will use your information only in accordance with the terms of their privacy policies. Like many sites on the Internet, the Site automatically collects information from your browser when you visit the Site or use the Services, including the Fohlio Chrome plugin. This information may include your IP address, your browser type and language, access times, the content of any undeleted cookies that your browser previously accepted from Fohlio (see “Cookies” below), and the referring website address. If you use our web clipper plugin, we may also collect your browsing history and location data. We may also combine all of this non-identifying information with other non-identifying information to infer trends or demographic characteristics. Like many sites on the Internet, when you visit the Site, Fohlio may assign your computer one or more cookies to facilitate access to the Site and to personalize your online experience. Through the use of a cookie, Fohlio also may automatically collect information about your online activity on the Site, such as the web pages you visit, the time and date of your visits, the links you click, and the searches you conduct on the Site. Fohlio may use this data to better understand how you interact with the Site, to monitor aggregate usage by our users and web traffic routing on the Site, and to improve the Site and our Services. Most browsers automatically accept cookies, but you can usually modify your browser setting to decline cookies. If you choose to decline cookies, please note that you may not be able use some of the interactive features offered on the Site. In addition, please be aware that other parties may also place their own cookies on or through the Site, and may collect or solicit personal information from you. Other cookies may reflect de-identified demographic or other data linked to the registration data you have submitted to Fohlio in hashed, non-human readable form. No personally identifiable information is contained in these cookies. Fohlio may use third party software and/or widgets that are integrated into the Site and via the Services, such as Intercom. These companies may collect information from you, such as your name and your email address. They may also use tracking technologies, such as cookies, to collect information about users who view or interact with their software and/or widgets. Fohlio does not provide any personal information to these third parties. Fohlio employs or engages other companies and individuals (including but not limited to Stripe and Intercom) to perform business functions on behalf of the Site and Services. These persons are provided with personal identifying information required to perform their functions, but are prohibited by contract from using the information for other purposes. These persons engage in a variety of functions which include, but are not limited to, removing repetitive information from user lists, analyzing data, providing marketing assistance, processing credit card payments and providing user services. Any supplied billing information (if collected by and through the Site, as opposed to being directly inputted and collected by and through third parties such as Stripe) shall be encrypted for transmittal to a third party intermediary for processing. Such billing information is used only to bill you for those purchases you choose to make through the Site. The process is designed to protect your billing information against unauthorized misappropriation by third parties. As the technological landscape is constantly changing, no security system is absolutely secure. We implement appropriate technical and organizational measures to protect the information we collect and store. Unfortunately, no security measures are 100% foolproof, and as such no network or system (including ours) can be guaranteed to be 100% secure against destruction, loss, alteration, unauthorized disclosure of, or access to information we collect and store. Fohlio cannot and does not guarantee the security of any of its databases and information contained therein, nor can Fohlio guarantee any supplied information will be absolutely secure from interception during transmission to the Site over the Internet. If you believe your information may not be secure for any reason, please contact us immediately at privacy@Fohlio.com. With third-party service providers who enable certain features or functionalities of the Services that you’ve requested (for example, by syncing with Quickbooks online in Fohlio using the Integration feature). As necessary in the event of a proposed or actual reorganization, merger, sale, joint venture, assignment, transfer, financing, or other disposition of all or any portion of Fohlio business, assets, or stock. Fohlio may also release your personal information to a third party in order to protect, establish, or exercise our legal rights or defend against legal claims; comply with a subpoena, court order, legal process, or other legal requirement; or when we believe in good faith that such disclosure is necessary to comply with the law, prevent imminent physical harm or financial loss, or investigate, prevent, or take action regarding illegal activities, suspected fraud, threats to our property, or as necessary or appropriate in connection with an investigation of fraud, intellectual property infringement, piracy, or other unlawful activity. You may access, correct, amend, or delete Content by accessing it within Fohlio. You control all Content you upload. Content you delete (including Content containing personal information) may be retained in archived or backup copies in order to enable you to use certain features like revision history and base snapshots. For instructions on how to permanently delete Content from your Fohlio account, please contact us at privacy@Fohlio.com. Please note that permanent deletion of Content through this process will impair or disable those features with respect to that Content. You may access, correct, amend, or delete Customer Information we have about you by logging into your account and navigating to your Profile page. If you wish to cancel your account, you may do so through your Plan page. If you do, personally identifiable information associated with your account will be deleted as soon as is reasonably practical or as required by applicable law. Please note that we may retain information that is otherwise deleted in anonymized and aggregated form, in archived or backup copies as required pursuant to records retention obligations, or otherwise as required by law. We may use some of the information we collect for marketing purposes, including to send you promotional communications about new Fohlio features, products, events, or other opportunities. If you wish to stop receiving these communications or to opt out of use of your information for these purposes, please follow the opt-out instructions by clicking “Unsubscribe” (or similar opt-out language) in those communications. You can also contact us at privacy@Fohlio.com to opt out. 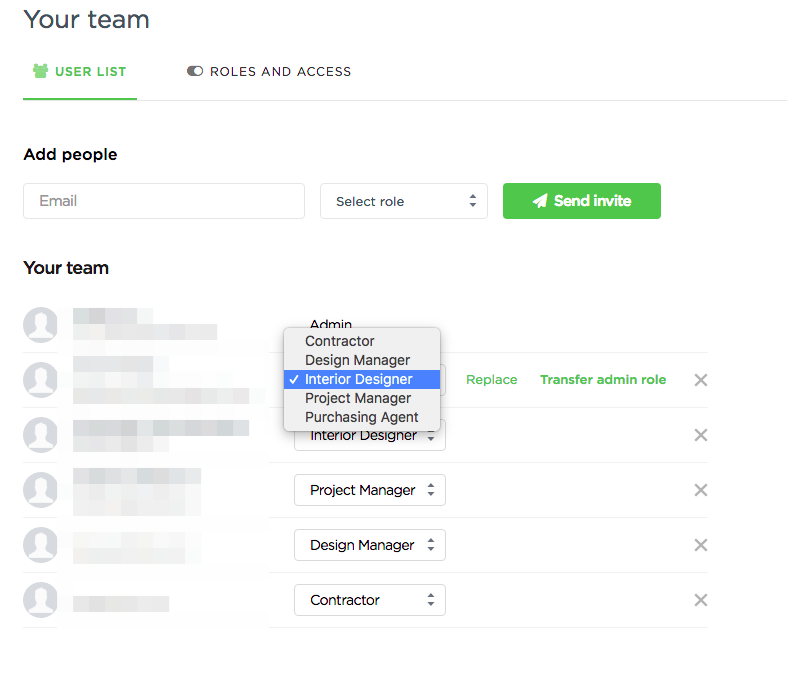 Fohlio is both a project product schedule creation and collaboration tool. We offer features that allow users to communicate with each other in semi-public spaces for purposes of collaborating on projects. Please use common sense and good judgment when posting in these collaboration spaces or sharing your personal information with other users on Fohlio. Be aware that any personal information you submit there can be read, collected, or used by others, or could be used to send you unsolicited messages. Fohlio generally does not remove content from collaboration spaces, and your posts may remain semi-public after your account is closed. You are responsible for the personal information you choose to post in collaboration spaces on Fohlio. Fohlio forbids the use of the Site and Services to individuals age 18 and below, without the consent of a parent or guardian over the age of 18. Fohlio does not knowingly collect personal information from children under the age of 13. With respect to transfers of information out of the European Union (EU), we may process some personally identifiable information pursuant to data processing agreements that include the EU Standard Contractual Clauses. To learn more about our data processing agreements, please contact us at privacy@Fohlio.com.